The available Sangoma Resiliency Enablement Suite (SRES) makes the Vega 200 the most resilient gateway in its class. In the event of a WAN failure, IP phones behind the Vega gateway can continue to call each other, be routed to a backup switch or connected directly to the PSTN. In addition, the use of the Sangoma Network Appliance Provisioning (SNAP) tool makes the Vega 200 the easiest to provision gateway on the market. Each E1/T1 interface can be independently configured as network side or terminal side. The Vega 200 gateway can therefore be connected to a PBX or the PSTN. This configuration provides no disruption to the configuration of existing equipment, flexibility & choice for call routing. All Vega gateways can support SIP & T.38 FAX. 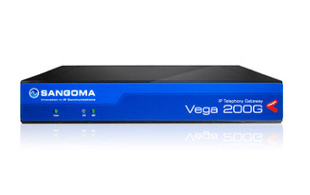 The Vega 200 gateway has proven interoperability with a wide range of existing telecommunications & VoIP equipment.